In May, 1960, American Cinematographer published the following article describing the new products being introduced by Panavision, Inc. The items described have been obsolete for decades, but they show the innovations that helped push the small company into the lead position of camera suppliers over the following years. PANAVISION'S new 65mm camera is streamlined, self blimped, and just slightly larger than a Mitchell BNC. Two of its salient features are a new type movement and a 200° variable shutter. The company which gave the industry Panavision 65mm cameras and Panatar lenses announces a unique method of producing films for Cinerama-type exhibition, new streamlined 65mm cameras, and a portable hand-held 65mm camera. Panavision, Inc., scored doubly in the Academy Awards this year, first-and somewhat indirectly-When Robert Surtees, A.S.C., won the Academy award for best achievement in Color Cinematography for his camera work on "Ben-Hur." and later when Panavision's President, Robert E. Gottschalk and Douglas Shearer, Chief of Research and Development at MGM studios, received the Academy's Class II trophy for Scientific and Technical achievement for the development of MGM's Camera 65 system of producing and exhibiting wide-screen motion pictures. Surtees used the Panavision-engineered 65mm cameras in filming "Ben-Hur." 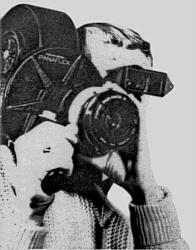 The part Panavision played in the development of the Camera 65 system was described in the March, 1960, issue of American Cinematographer (Why MGM Chose Camera 65," by Herb A. Lightman). DIAGRAM shows how Cinerama-type motion pictures are extracted from a standard 65mm Panavision camera negative to produce the three prints required for Cinerama or Cinemiracle type presentations. In recent months Panavision engineers have busied themselves bringing to fruition some other "surprise packages'' for the industry. These include a process of producing Cinerama type 3-panel movies with a single 65mm camera, a streamlined, self-blimped Panavision 65mm camera not much larger than the Mitchell BNC; and a slick hand-held 65mm camera-all of which will be described in ensuing paragraphs. To extract 35mm strips for Cinerama from an original 65mm negative shot in the Ultra-Panavision process, the negative is set up in a custom-designed printer and a special de-anamorphosing printer lens is mounted to scan first the left side of the 65mm frame then the center, and finally the right side-each time recording that segment of information an a separate 35mm print, resulting in three perfectly matched panels to be projected side by side on Cinerama or Cinemiracle screens. The screen result is similar to that produced by these two processes, but free of the typical distortions and limitations inherent in a three-camera system. Extraction of the three prints from the Panavision 65mm negative can he done only by Technicolor laboratories. Because of the unique aspects of imbibition printing, Technicolor can print optically without producing a second generation dupe print. Technicolor's very much greater flexibility and control of color, combined with the companys excellent wet printing technique gives the Ultra Panavision extraction process the advantages of these additional controls and quality. The Cinerama and Cinemiracle processes both utilize three cameras, mounted side by side in an arc which covers a very wide aggregate angle of view. In both processes the center camera shoots forward and the two cameras on either side criss-cross, the right camera producing the left panel and the left camera producing the right panel. Because 27 1/2mm extreme wide angle lenses are the standard for these cameras, there results an inherent distortion in certain types of scenes which is distracting to the viewer and forces rigid limitations upon the cameraman. 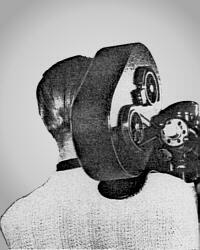 For example, closeups of people shot with Cinerama cameras show typical wide-angle closeup distortion. Noses appear very long and foreheads slant back. Ears are very small in proportion and chins recede. The result is that actors look very odd in closeups, so odd, in fact, that close ups must generally be avoided when filming in a three-camera process. The Ultra-Panavision method, by contrast, permits use of lenses in a wide range of focal lengths. Thus, closeups are natural and undistorted. Were a cinematographer to photograph an infinity scene, first with one of the three-camera processes and then for the Ultra-Panavision extract process-and both scenes then projected, one following the other-certain startling differences would immediately be noticeable. One difference is that the Ultra-Panavision method produces no bending or curvature of horizons; water horizons, for example, remain straight. Another improvement affects the perspective of scenic shots. For example, mountains in the distance, photographed in Ultra-Panavision, retain approximately the same height in relation to foreground objects as when viewed with the naked eye. The same scene photographed in a three-camera process, with its wide angle lenses, would produce a diminution of the distant mountains, flattening them out, reducing the apparent steepness and producing a much less dramatic perspective. When filming in Cinerama or Cinemiracle, as the camera moves gradually in on a large flat object, (an ocean liner, for example), the ship begins to bend about a third of the way back from the bow and about a third of the way toward the center from the stern, so that when the ship fills the screen it is bent fore and aft, creating a ludicrous effect. Were the same scene photographed in 65mm for Ultra-Panavision extraction such distortion would be rectified: no matter how closely the camera approached the ship there would be no bending of lines on the screen-result of the scene being photographed with a single lens having a single perspective. Take a scene in which two people appear, one on either side of the screen, and they begin to walk toward each other. The only way they can be made to appear to meet, using a three-camera process, is to direct the actors to walk along paths which are at an angle to each other. In other words, they must move in false perspective along false lines. In a recent Cinerama production this problem became so acute that special sets had to be built with curves and bends to rectify the false perspective inherent in three-camera systems. Three-strip extracts produced by the Ultra-Panavision method are projected in exactly the same manner as those produced by three-camera systems-but lines do not bend, horizons are straight, closeups are natural, and when people walk toward each other a perfectly realistic effect is achieved by directing the scene as it would be staged for any conventional cinematographic process. The Ultra Panavision extract method has other important technical advantages resulting in much smoother presentations In Cinerama and Cinemiracle three separate strips of film run through three separate cameras having three separate movements It is technically impossible to adjust these movements so that they are exactly the same. Even slight differences are greatly magnified on the huge screen producing an inevitable jiggle between the three panels. 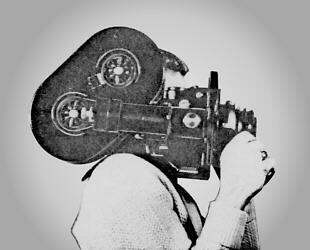 Since the Ultra-Panavision negative is photographed in one camera with a single movement this problem is eliminated. One of the greatest advantages of the Ultra-Panavision extract method becomes apparent in the developing and printing of the three final 35mm strips that go to make up the complete picture. A serious problem in the three-camera system has always been the struggle to get an even match of color tones and densities between the separate panels The difficulty again lies in the fact that three separate strips of negative must be used. Even though film having the same emulsion number is used in all three cameras and constant control is maintained in the developing process a certain variation in color tone and density is almost unavoidable, especially in scenes which include a great expanse of sky. There is no such problem with the Ultra-Panavision method because the entire original frame of the picture is on one piece of film and receives the same uniform development. Since only one lens has been used in shooting the frame that becomes three segments, there is no necessity to compensate in printing for slight differences in light transmission as when processing negatives produced by three different lenses of three camera systems. Panavision's system also offers important economic advantages to the producer in the phases of editing and exhibition. Instead of having to make three separate strips of work print for editing, a single 35mm print-down work print is made from the 65mm negative. Thus, editing can proceed at the same rate as with a conventional 35mm feature. The same marked work print can also be used for scoring and dubbing, making it unnecessary to become involved in the expensive and cumbersome 3-strip phase until after the negative has been cut and the answer print is about to be made. Features photographed with three camera systems can only- be shown on a first run roadshow basis in the few theatres that have special (and extremely costly) triple-projection setups. The difficulty of producing a smooth composite of the three panels on a single film precludes a second run on conventional equipment, thus denying the producer any further revenue. Features produced with the Ultra-Panavision extract method, however, can enjoy a roadshow run with 3-strip projection, and can also be printed down to 35mm standard or in anamorphic aspect ratios for profitable second runs in general theatres. The economic advantage to the producer is enormous. It is also with the producer and his budget in mind that Panavision has designed and built a new series of light-weight, compact 65mm cameras, together with a whole new series of lightweight lenses (both anamorphic and spherical) in a wide range of focal lengths to fit these cameras. The cameras originally used in the Panavision 65mm processes for photographing "Ben-Hur" and The Big Fisherman'' were outsized, heavy machines which, because they did not have silent movements, had to be housed in cumbersome blimps that weighed 300 lbs. minus the camera. As a result each new set-up was a major project—difficult, time-consuming and expensive. Two of the three new Panavision 65mm cameras, designed and built completely at the Panavision plant, are very similar in size and weight to present studio 35mm cameras. They are extremely versatile, operate quietly without the need for cumbersome blimps, and can readily be set up and moved around with speed. The first of the new Panavision 65mm series is a self-blimped camera similar to the regular stock Mitchell BNC in size and appearance, but incorporating several features unique in camera design. It is engineered to run so quietly that quality sound can be recorded with the mike right next to the camera. Its outstanding innovation is an entirely new type of movement designed by Panavision engineers, which includes a 200° shutter-a feature that has heretofore never been available in 65mm studio cameras. The advantages of a 200° shutter are twofold: (1) It permits the cinematographer to stop the lens down farther with a given amount of light, insuring a greater depth of field, and (2) it greatly reduces cross screen strobing-a phenomenon which occurs when large, sharply defined objects move across the screen so rapidly that there is a considerable span of movement between each individual frame. This effect is especially disturbing on larger screens where definition is sharper. The 200° shutter opening allows a greater amount of blur to show on the edges of moving objects, resulting in less emphasis on the strobe effect. It also allows for smoother panning of close objects. Another advantage of the new Panavision 65mm camera movement is that it operates in such a way that the film is brought to an abrupt stop with the registration pins fully into the perforations, and the film is stopped before the shutter opens for the exposure. The shutter opens and closes completely before the pins start to withdraw; then the claws pull the film down, insuring a steady picture on the screen. Panavision has also developed what it calls its 'standard" 65mm camera, which is similar to an NC. It has a silent movement and was designed to be used in conjunction with the self-blimped model when two cameras are required on the scene. It is also so designed that, in the event that anything happens to camera No. 1, it is possible in a matter of minutes to remove that camera from the housing and substitute camera No. 2. PANAVISION'S surprise 65mm camera is this hand held portable type with convenient hand grip and unique shoulder rest. Weighing 24 lbs. equipped, it features a 500-ft. magazine. Electric motor operates from 32-volt wet- or dry-cell battery pack. Still another (and perhaps the most revolutionary) 65mm camera model produced by Panavision is a hand held model with a hand-grip and form-fitting shoulder support. Carrying a 500 foot magazine, it is extremely compact in design. The camera with magazine and motor weights a mere 24 lbs. The motor operates from a lightweight wet or dry-cell battery pack. While the most interesting feature of the camera is that it actually can he hand-held, producing a steady image under the most difficult conditions-its greatest advantage to the cameraman is that its extreme light weight and compact size permit it to be quickly set up in positions where other cameras could not be used. Let us consider, for example, a scene that must be shot from an almost inaccessible spot-like the top of a tree or telephone pole, the mast of a ship, or the front of a small rowboat. To shoot such a scene, even in 35mm, with a camera of the NC type would require a great deal of time spent in rigging and in many cases the shot could not be made at all. The small portable 65mm Panavision camera can either be carried up to the remote vantage point and handheld by the operator, or it can be quickly- mounted with a clamp and tripod socket. It permits easy shooting in 65mm from cars and other moving vehicles and can be quickly rigged for automatic shooting by means of remote switches. When not actually used as a hand-held camera, the pistol-grip and curved shoulderbrace are readily detachable so the camera can be mounted on a tripod like any standard studio camera. COMPONENTS of the Panavision hand held camera. A�500' magazine. B�Magazine cover plate. C�Mitchell finder. D�Sport Finder. E�Tripod mounting plate. F�Camera box with motor. G�Finder matte. H�Lens. I�Sunshade. J�Spare 32-V wild motor. K�Shoulder rest. L�Pistol grip with trigger switch. M�Sunshade mounting rods. N�Lens cap. All three of the new Panavision 65mm cameras are being used for the first time in photographing Otto Preminger's production of "Exodus", which is currently shooting on location in Israel. To complement the new cameras the company has created a whole new series of lightweight anamorphic and spherical lenses, the new widest angle lens having an undistorted angular field of well over 100 degrees. The Auto-Panatar lens, which won an Academy Technical Award last year, is a taking lens for 35mm anamorphic photography. Extremely sharp and completely free from distortion even in the closest closeups, the Auto-Panatar series has already been used in many feature productions. A final Panavision achievement, which bids fair to revolutionize 35mm anamorphic photography of night sequences in color, is the new Ultra-Speed Panatar lens with its incredible speed of f/1.0. Available in 50mm focal length it permits, for example, photographing scenes in front of a lighted store window with moderately fast film using little or no auxiliary lighting. Director of Photography William Daniels, A.S.C., one of the Auto-Panatar's most enthusiastic boosters, reports that he shot a night street carnival with this lens and the old-type slow-speed Eastman Color negative and achieved excellent results, even in long shots, with a light level of less than 40 foot-candles. Panavision is also manufacturing new printer lenses which convert CinemaScope to flat and vice versa, convert 65mm to 35mm, and Technirama 35mm horizontal negative to 70mm release print. The first conventional live action film using the latter printing system will be the $10,000,000 action-epic "Spartacus." There are other new designs on the drawing boards at Panavision, including a new ultra wide-angle anamorphic lens for 35mm photography, a 35mm anamorphic lens which will include the zoom feature, plus other new optical and photographic design, about which it is too early to talk.